To us, eventing is the pinnacle of partnership between horse and rider. The horse must love this sport as much as the rider does. This is essential for safety while galloping over solid fences at high rates of speed. There must be a deep level of trust and partnership between horse and rider. The first phase - dressage - shows the graceful partnership of horse and rider through a sequence of movements on the flat. The next phase - cross-country – challenges the pair’s bravery, fitness and determination as combinations navigate a series of solid obstacles and varied terrain. In the final phase - show jumping - pairs must again prove their precision as they clear a course of delicate fences. Competitors accumulate penalty points in each phase, and at the end of the event, the pair with the lowest score takes home top honors. Held over one, two or three days, eventing is one of the few Olympic sports where men and women compete alongside one another as equals. Visit www.DiscoverEventing.com for more information about Eventing. While at Body N Soul we have an integrative approach, pulling from many different modalities and disciplines within our lessons, boarding and training, our background comes from a foundation of Eventing (and Pony Club). We grew up in Virginia fox hunting first flight with the Blue Ridge Hunt from the ages of 7 onwards, establishing a deep love for galloping across fields. Our pony club (Blue Ridge Hunt Pony Club) further instilled the importance of true horsemanship and horse management that is integral to this sport. Brittany competed at her first starter trials on her 8th birthday on a wonderful Welsh Pony named Farnley Tambourine. To this day, she can remember the excitement of riding Tambourine cross country! From there, she was hooked. Soon after that, Ellie started competing and from there they continued to move up through the levels; mostly on homebred ponies that they brought along themselves. Both Brittany and Ellie had the opportunity to train extensively with Olympian and Olympic Coach Jimmy Wofford in Virginia. Brittany has competed through the Classic (long format) CCI* level, and schooled through the Intermediate level. Ellie has competed through the Training level, and schooled through the Preliminary Level. Ellie also won the first ever held Training Level 3Day event at Waradaca on Denver's Jovial Lass, a Connemara X Thoroughbred mare that Brittany and Ellie started and brought up to the Preliminary level. While we were teenagers competing in Area II, we had made an arrangement with our parents. When we turned 18 and graduated high school, we had to go to college. Our parents had fully supported us as young riders competing through levels that we're sure terrified them. However, they also firmly believed that education was important and that we needed to have a "back up plan" in addition to riding. So, while of neither us stopped riding and educating ourselves, we took a hiatus from eventing and sold our upper level horses to lovely homes who were looking for horses to show them the ropes of eventing. So, Brittany went off to James Madison University to study psychology, and Ellie went to Cornell University to study design. However, it became even more apparent over time, that we both loved to teach new riders, to continue to bring along young horses, and to compete. While Brittany finished her second Masters program, she and Ellie (and their third sister, Liese) reunited in Colorado where they have opened a facility to do just this. Our passion here at Body N Soul is educating new riders and exposing people to the sport of eventing. We believe in cross training and classical foundations. 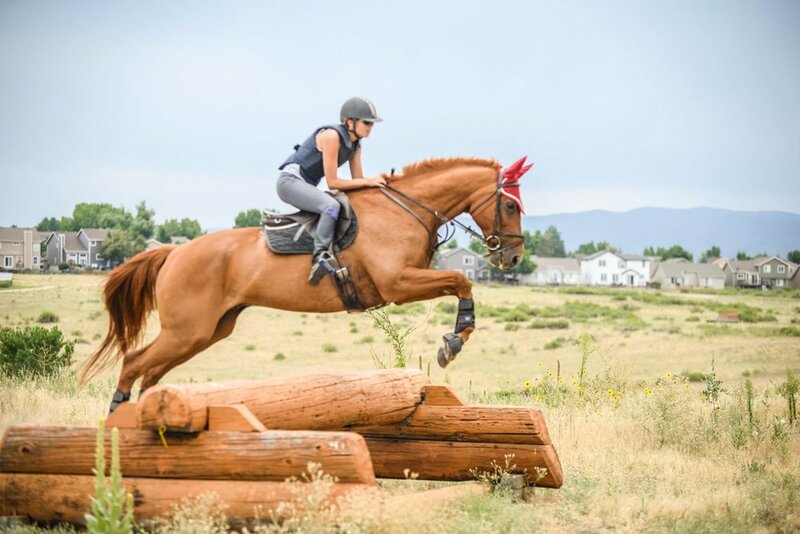 Because of this, we love to help people find the right horse and the right partnership for them, while helping them to be safe and have fun learning about eventing. To us, eventing is the pinnacle of partnership between horse and rider. The horse must love this sport as much as the rider does. This is essential for safety while galloping over solid fences at high rates of speed. There must be a deep level of trust and partnership between horse and rider. We teach new eventers how to be safe, how to have fun, and how to be true horsemen, all while pushing themselves to grow as humans. We specialize in bringing along young horses for eventing, as well as young riders. We will travel to farms to provide lessons (both dressage and jumping) and offer off site cross country schooling days with other riders. We also offer limited onsite Training/Boarding at Body N Soul. We do have several of our own horses that are event horses that are available for lessons to be able to educate and introduce interested riders to the sport as well. Please contact Brittany at brittany@bodynsoulequestrian.com for more information about our Eventing Program or Training Program.